Today we're stepping away from the park specific coffees offered up by Joffrey's Coffee & Tea Company, but not too far away. Beginning in 2009, Disney began a project with Conservation International to create sustainable agriculture in the Alto Mayo Basin region of Peru. In Alto Mayo, coffee production accounts for the livelihood of 240,000 individuals, which means that education and hands-on demonstrations of sustainability would not just save the environment, it would also allow individuals to thrive. Enter Joffrey's who supported the project by sourcing a single origin coffee from the region and even sending their Roastmaster to witness the work of the project firsthand. It wasn't long before the idea of serving this coffee in Walt Disney World became a way to not only move this work forward, but to raise the profile of the work. Unlike other roasts that were created for specific restaurants, the Alto Mayo Protected Forest coffee will be found at 11 restaurants between Walt Disney World and Disneyland to start, followed closely thereafter by restaurants that serve pressed pot coffee. I highly recommend learning more about this roast, even if you're not a dedicated coffee drinker. 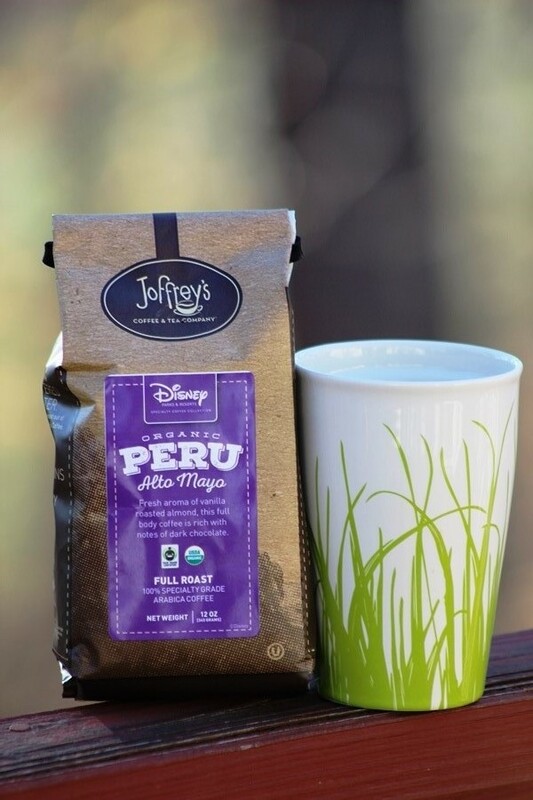 You can read more from Disney, including in which restaurants you can find the coffee, in this article: New Fair Trade Coffee Helps Peruvian Communities. Additionally, you can learn more about Joffrey's work on the project from this article: Fair Trade Coffee With a Conscience. Now, on to the review you're looking for! Alto Mayo Protected Forest (Medium) – Our Alto Mayo organic & fair trade coffee comes from a protected part of the Amazon rainforest in the province of San Martin. Farmed using sustainable methods, the unique soil, partly nourished by the Mayo river, gives these exceptional beans their deep chocolate notes and fresh vanilla almond aroma. You all know by now that I am a fan of dark roasts but this medium roast coffee blew me away. Since we have established that I am a fan, let’s start with the aroma. From the first sniff, I could smell the bitter dark chocolate and almond. The scent made me assume I would be delving into a very bitter roast but I was definitely wrong. I still tasted the chocolate and almond, but upon brewing, vanilla came into the mix and the entire flavor profile mellowed to an absolutely wonderful cup of coffee. I tried this roast black (I normally drink my coffee with stevia and milk) and I have to say, the smoothness stayed. I cannot think of many roasts I would drink black, but this is one that I wouldn’t mind enjoying in that fashion, especially if paired with a sweet dessert. Overall, I can’t recommend this roast enough. Not only is it organic and fair trade, which means you are changing the lives of the farmers growing the beans, it has amazing flavor that actually matches some of the local coffee roasters we have in our area. It can be enjoyed with almost any meal, dessert, or as your morning pick me up. You won’t be disappointed. In fact, we will be reordering this roast as soon as the bag is empty. When you post the Joffrey's posts I feel wonderful :) I love drinking coffee at WDW.